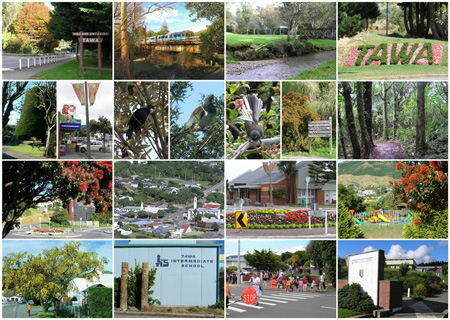 12-15 minutes north of central Wellington - by both motorway or commuter train - lies the community of Tawa with around 14,000 residents (including Grenada North and the Takapu Valley), the northernmost suburb(s) of New Zealand's capital city, and geographically separated from the rest of Wellington. Very much a family-oriented community, Tawa has a good range of schools including a highly regarded College (secondary school), a wide mix of sporting and recreational facilities, and a number of good churches on its Main Road. All in all this is a very pleasant valley in which to live, with affordable housing and a strong community spirit. There is - at least in the opinion of the writer - something nice about going to the local supermarket, Tawa's one and only, and invariably seeing at least 3-4 lots of people you know - assuming, of course, you have nothing to hide. "When I think about Tawa I think about a small community that isn't too small that everybody knows everybody, but small enough that everyone has a connection with someone. There's not an exclusive feel to Tawa. It's such a good place to grow up in." - Kieren Gera, former Tawa College head girl . The TawaLink website came into being in 2002 and is operated by Malcolm Sparrow who took up residence in Tawa in October 1996. Email info@tawalink.com or phone 027 232 2320. The website exists to provide information about Tawa, as well as to keep local people informed about events taking place in the community. That now happens primarily by means of a community eNewsletter which is sent out monthly to around 1250 Tawa households, businesses, schools, churches and clubs/groups (anyone who has an interest in the community of Tawa), usually in the first half of the month. Contributions to that newsletter are welcome - email here. Unless indicated otherwise, all photographs appearing on this site have been taken exclusively for tawalink.com and should not be reproduced elsewhere without contacting us first. We're likely to agree to your request if it's for non-commercial purposes as long as you give us due credit.